The most distinguishing mark on the red drum is one large black spot on the upper part of the tail base. Having multiple spots is not uncommon for this fish but having no spots is extremely rare. The color of red drum ranges from a deep blackish, coppery color to nearly silver. The most common color is reddish-bronze. Red drum is a fast growing fish reaching approximately 11 inches and one pound in its first year, 17-22 inches and 3 1/2 pounds in two years, and 22-24 inches and 6-8 pounds in three years. The record red drum was 94 pounds and was caught on the East coast. The current Texas record 51 1/2 pounds. For the first three years of their lives red drum live in the bays or in the surf zone near passes. Evidence from tag returns show that they remain in the same area and generally move less than 3 miles from where they were tagged. As they mature, they move from the bays to the Gulf of Mexico where they remain the rest of their lives, except for infrequent visits to the bays. Although there is little evidence of seasonal migrations, anglers find concentrations of red drum in rivers and tidal creeks during the winter. Young red drum feed on small crabs, shrimp, and marine worms. As they grow older, they feed on larger crabs, shrimp, small fish, and sometimes their cousins, the Atlantic croaker. They generally are bottom feeders but will feed in the water column when the opportunity arises. A phenomenon called “tailing” occurs when the red drum feed in shallow water with their head down in the grass and the tail exposed to the air. Predators include humans, birds, larger fish, and turtles. Between the third and fourth year, the red drum reaches sexual maturity. Spawning season is from mid-August through mid-October in Gulf waters, near the mouths of passes and shorelines. Eggs incubate for 24 hours. Larvae are carried into tidal bays by the current. They move to quiet, shallow water with grassy or muddy bottoms to feed on detritus (dead or decomposing plant and animal matter). The oldest recorded red drum was 37 years old! 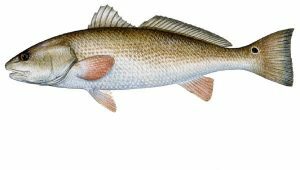 Red drum are related to black drum, spotted seatrout, weakfish, mullets and croakers, most of which also make drumming sounds. Scientists believe that the black spot near their tail helps fool predators into attacking the red drum’s tail instead of their head, allowing the red drum to escape. Red drums prefer shallow waters (1-4 feet deep) along the edges of bays with submerged vegetation such as seagrasses. They are found over all bottom types but they seem to prefer areas with submerged vegetation and soft mud. These fish are also commonly found around oyster reefs. Breaks in continuity of shorelines such as coves, points, jetties, old pier pilings, and guts attract them. They prefer soft mud along jetties, pier pilings and jetties. They are often found in water so shallow that their backs are exposed while swimming. During cold spells large numbers of red drum can be found in tidal creeks and rivers. They can live in fresh water and have been found many miles upriver. One attractive characteristics of this fish is its willingness to take most kinds of bait, both natural and artificial. The best natural baits are live shrimp, small finger mullet, Atlantic croaker, and small live blue crabs. Live shrimp are fished under a popping cork or “free shrimped” using a small weight and letting the shrimp swim freely. Live fish are best on the bottom using a slip-sinker type rig where the fish can swim freely. The bait fish are hooked through the lips or through the top of the back behind the dorsal fin. Small blue crab are fished on bottom and are hooked through one of the swimming legs at the rear of the crab. Stalking the shallow grass flats for red drum is the ultimate challenge for the wade anglers. Artificial baits such as 1/2 and 1/4 ounce shallow-running gold, copper, or silver spoons are favorites. A weedless spoon is used in areas of heavy submerged or floating vegetation. Fish-shaped plugs, both floating and shallow-running, are effective over the grass flats. Shrimplike plastic worms and jigs are good and both are fished under corks or bounced along the bottom. The surf provides excellent red drum fishing. The best artificial baits are the heavier spoons and slow sinking fish shaped plugs. Plastic worms are also effective bounced along the bottom. Saltwater flyfishing for red drum is increasing in popularity. Flyfishers sight-cast small surface popping plugs, baitfish type streamers or shrimp and crab imitation flies to “cruising” or “tailing” red drum. Rod lengths range from 8 1/2 to 9 1/2 feet casting weight forward, floating line from six to nine weight. Leader lengths can be from seven to 9 feet with a tippet strength from eight to 15 pounds. Once hooked, a red drum on flyfishing tackle is a worthy, exciting adversary. “Bull” reds are best caught with natural bait. Fresh cut mullet, larger live mullet (6-8 inches long) and blue crab are the best baits. Both single and double-drop bottom rigs are good. A heavy grabbing sinker is needed to keep baits stationary on the surf bottom. Tackle varies according to angler preference. Surf and pier fishers for “bull” reds prefer rods more than 10 feet in length and stiff enough to handle a heavy terminal tackle. Reels should be large enough to handle several hundred yards of 25-40 pound test line and reels should have a good drag system. For smaller fish (less than 10 pounds), the best rod to use should be 6 1/2 to 8 feet long, has a medium action, and has a two-handed grip to help the anglers in long distance casting. Reels should be able to hold at least 100 yards of line. Line strength will vary depending on what type of habitat is being fished. Heavier line (17-25 pounds) is needed when fishing around oyster shell, rocks, or pilings. Lighter line (8-15 pounds) is favored when fishing the grass flats. Leaders are optional, depending on line weight and where the fishing occurs. Anglers must remember that there are bag and possession limits and minimum-maximum size limits on red drum. 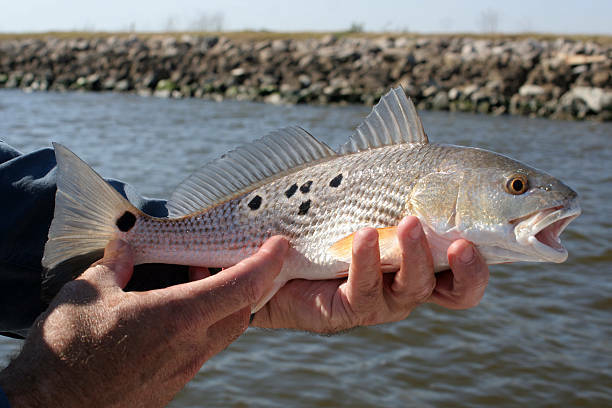 Be sure to be familiar with the regulations each year when fishing on the Texas Gulf coast. The red drum is a popular game fish in coastal waters from Massachusetts to Mexico. Red drum is considered a great sport fish because it will hit on most kinds of bait. The Texas record for a red drum catch was 51.5 pounds (23 kg); however, a red drum weighing 94 pounds (42.69 kg) was caught along the North Carolina coast.